After I started listening to personal finance podcasts about a year ago, I began hearing mentions of sites which allow consumers to buy fractional shares of stocks and ETFs. I don’t invest directly in individual stocks myself, so I did not give these services much thought. 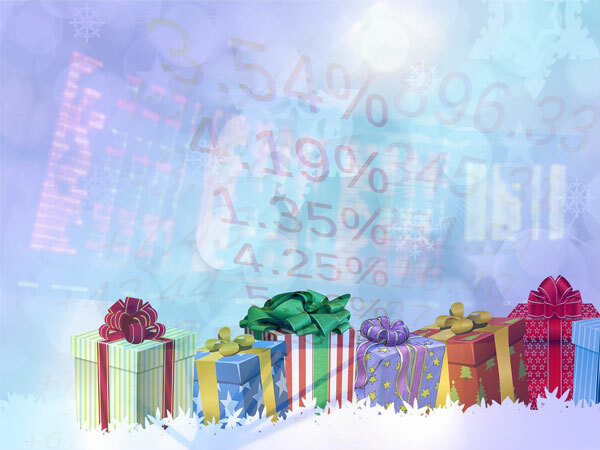 But in December, I had the idea that Stockpile gift certificates might be fun and novel Christmas gifts for my two middle school-age kids, especially since personal finance and investing have been big themes at home recently. In 2018, my family and I went through some pretty big life changes as part of our financial independence journey and masterplan. Around January, we concluded that we were enough above our FI number to consider retiring from the corporate world by the end of the year. We also decided we could bolster our plan and financial stability by practicing geoarbitrage and moving out of the uber-expensive Bay Area, where we owned a 3-bedroom house on the peninsula. We briefly considered the Las Vega area (e.g. Summerlin or Henderson), but being Californians at heart, we decided to focus on the Sacramento region instead. Over Presidents Day weekend, we started looking for houses. We closed on a home in late March. My last day at work was in early June, and two days later we moved to the Sierra Foothills. We sold our Bay Area house in late June and closed escrow in July. Whew! That was a lot of change in a short amount of time for me, my wife, my daughter and my son. Because my wife and I were consumed with analyzing, deliberating and planning for this transition, my kids overhead a lot of discussion about our finances and our investments. My daughter, in particular, is pretty savvy about money and scored higher than the average American on a financial literacy test I gave her last year. She and my son were both part of the discussion and decision. Since my kids already had soaked up so much financial knowledge by osmosis over the course of the year, I thought the time was ripe to give them some hands-on experience with investing, with the underlying goal of teaching them how the stock market works. And hence, my idea to give them some funny money to play around with in Stockpile. One reason I chose Stockpile is that the company has designed flows into their product for creating and managing custodial accounts. As part of its feature set, Stockpile allows kids to have their own login so they can track their holdings and request trades (via a permission flow which goes through the parent). Among their other gifts, we decided to give each kid $100 towards Stockpile for Christmas. 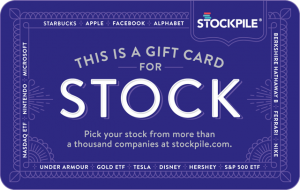 Stockpile actually has a gift card feature for just this purpose, and you don’t have to be an account holder to buy a gift card for someone. However, we opted not to use this feature, so we could hedge against the off chance that our kids might decide the whole idea was stupid. Instead, we printed homemade gift cards using Stockpile imagery. When our kids opened their envelopes with our custom gift cards inside, we had to explain what they were and what they could do with them. Fortunately, they both liked the idea — or at least didn’t protest before moving on to open more presents. The sign up flow for Stockpile was pretty standard for a financial institution. Provide first name, last name, email address, and password. Choose an account type: Individual (over 18) or Custodial (under 18). I choose Individual because my intent was to create the parent or master account. Identity verification (required by the U.S. Patriot Act). Over the next several days, I kept checking back on the site, only to find my account status unchanged. After four days, with no email contact from Stockpile (other than reminders to fund my account), I contacted customer support — which Stockpile provides exclusively by email. In light of recent events at Equifax, your credit bureau has restricted your credit file. Before we can approve your account for trading, we need to verify your identity. In order to do so, we need a picture of your valid government-issued ID. As soon as your Stockpile account is verified and opened, you can link your bank account and begin depositing funds. We regret the inconvenience, but your security is always our top priority. Thank you for being a Stockpile customer. This message is actually a bit misleading and presumptuous since I was the one who froze my credit file at all three major credit agencies as a best practice security measure against identity theft (Equifax did not initiate the freeze out of the kindness of their hearts). In any case, this gave me the clue I needed. After clicking through the link in the email (normally not best practice, but my password manager ensures such links are not phishing attempts), I was able to upload a scan of my driver’s license, and the site told me to hold tight while they reviewed my submission. I updated the thread with customers support and within 30 minutes, Stockpile confirmed by email that my account was approved. Your trading account is good to go! The next step is to transfer cash into your account so you can begin investing. They did not notify me by email (as they promise to in their help) that my account was blocked and required additional documentation. It turned out that the request for more documentation actually was on the website, but it was buried under the Settings section of my Stockpile dashboard. Stockpile could have provided a much better user experience by including an alert message on the main landing page after you sign in. That way, even without an email notification, I could have noticed the request much sooner. Once I got past this hurdle, I proceeded to add custodial accounts for my kids. This process is very similar to the original registration flow, except that you must provide the same info for the minor (including Social Security Number). I think you can actually create the custodian account through the front door registration flow (i.e. while not signed in), but I initiated the flow from the signed in dashboard via the “Add account” link. After registering my kids, their accounts went into Pending Approval status, as expected. Stockpile again wanted additional documentation, which I discovered by chance on the Settings pages for their accounts. As it happens, the credit files for both of my kids are also frozen (I froze them after an Anthem breach several years ago, but it’s really best practice for ANY minor). So, I concluded that Stockpile wanted their government IDs, and I proceeded to upload their passports. After that, the site was STILL asking for government ID upload, so I surmised that they wanted my ID again. So, I uploaded my passport, and finally, after a short time, their accounts were approved. In short, I had stumbled on another shortcoming in the UX of the onboarding flow: I suspect that I did not need to upload my kids’ passports and that the site was asking for my ID all along. However, Stockpile did not provide any clear messaging about whose ID they were requesting. And, yet again, they failed to notify me by email or with a prominent web alert (fortunately, I knew to look on the Settings screen). The other main onboarding activity is to transfer funds in your account. While I was waiting for Stockpile to approve my kids’ accounts, I linked my checking account (which was easy and happened in real time). I initiated a transfer, which took a few days to complete. 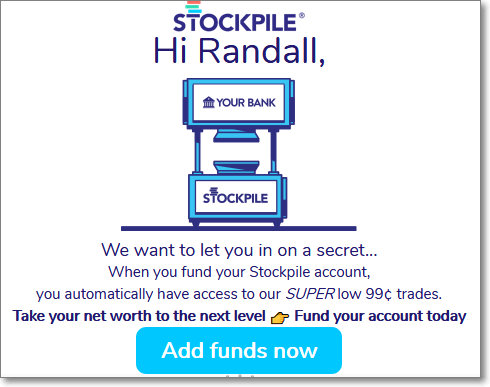 Stockpile sends you nearly daily email reminders to fund your account. Finally, I had money in my account and my son’s and my daughter’s accounts were both kosher and ready to go! What could go wrong? One more thing, as it turns out. I had transferred the funds into MY Stockpile account under the erroneous assumption that any account would be able to use the money to buy stock. Once I discovered my mistake, I looked for an option to transfer the funds internally between our Stockpile accounts. Alas, no such option exists, even though such capabilities exists at every bank I’ve done business with (maybe the rules are different for brokerages). 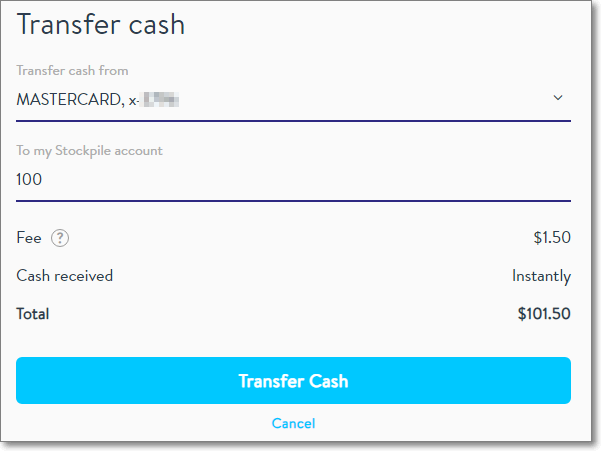 I reversed the transfer from my Stockpile account back to my bank. I executed two real-time transfers via my bank’s debit card (one for each custodial account). Debit transfers incur a 1.5% fee from Stockpile. Normally, I avoid such fees like the plague, but in this case it wasn’t worth a further delay just to save a few dollars. I was impatient after all of the preceding glitches. Stockpile allows instant transfers from a debit card, albeit with a 1.5% fee. Transfers from linked bank accounts are free but take longer. With the funding of my custodial accounts complete, via the debit card option, everything was now in order to actually buy some stock. Stockpile charges a $0.99 fee for each trade (they do have to make money, afterall). With larger purchases, this would be a blip, but since each of my kids was buying stock in ten dollar increments, they actually ended up getting only $9 in equity with each purchase. This is probably a good lesson for them to learn about fees. I’ll also have to remind them to track their performance against $90 of investment vs. $100. You have to purchase each stock one at a time. The flow is quick, but that still adds up to quite a few clicks. I would have liked the option to add stocks into a cart and then complete the purchase all at once. I don’t know if this is a failing of the UX or a legal restriction. The process of buying stocks on Stockpile is easy and fun. Select the custodian account in the left navigation. Scroll down and click on the “Create Login” action button. This was easy enough, but I think Stockpile should also explain the steps in their help. To this day, I am not sure whether I could have achieved the same thing by signing up my kids via the front door flow. After creating logins for my kids, I was able to set them up on their iPhones with the Stockpile app. Overall, I think Stockpile’s help content could be more robust. For example, at some point, I discovered I would need to opt in for dividend reinvestment. The help page about how to do this refers to screen navigation in the mobile app which is different from the desktop web browser flow. Stockpile could include instructions for both mobile and web. (Google Support does this with different steps outlined for Computer vs. Android vs. iPhone & iPad.) Sometimes it’s the the smallest details which are the key to delighting customers. In the end, the number of days I spent onboarding with Stockpile was at least twice as long as it should have been. During that time, the stock market started to recover from its recent losses, so as a result, we probably missed out on some good market timing for our purchases (not a huge deal on such a small investment but still annoying). Getting started with Stockpile has already revealed some interesting findings with my kids. For example, my daughter is so risk averse that she did not want to risk $100 in the market and decided to accept only $50 from us. Fortunately, she does understand the importance of investing to beat inflation and has many years to build up her risk tolerance. My son is not very worldly yet and does not really understand the stock market, so this should be a good learning experience for him. So, which stock did my kids pick? Stockpile makes it fun for kids or newbie investors by letting you search for stock by company, brand, or symbol. For example, a kid might want to ignore investing principles and just pick their favorite brands. In our case, we adopted a mix of strategies picking the stock based partially on brand affinity, partially on five year stock performance metrics, and partially on industry sector diversification. Below is a screenshot of my daughter’s selections for her $50 investment. When she bought LVMH (which owns brands such as DKNY, Louis Vitton, and Tag Heuer), she had searched for and selected Sephora, so Stockpile shows the brand she selected prominently. Let’s face it: it’s more fun for a kid to own Google than Alphabet. 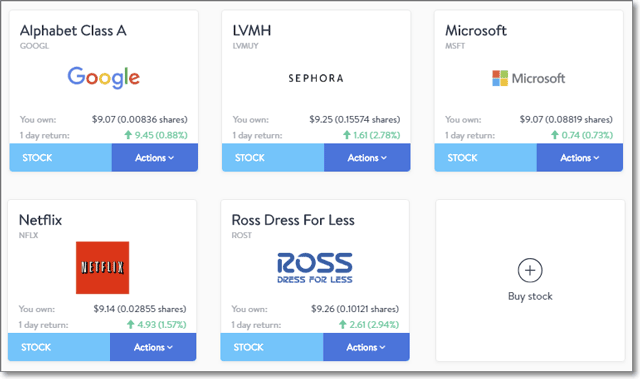 In a future post, I’ll likely revisit Stockpile to review our experiences with tracking stock performance (and possibly with buying more stock) and also to discuss if, or how, the experience is benefitting my kids. Now that we have reached the fun part, I’m sure my messy onboarding experience will fade quickly from memory.